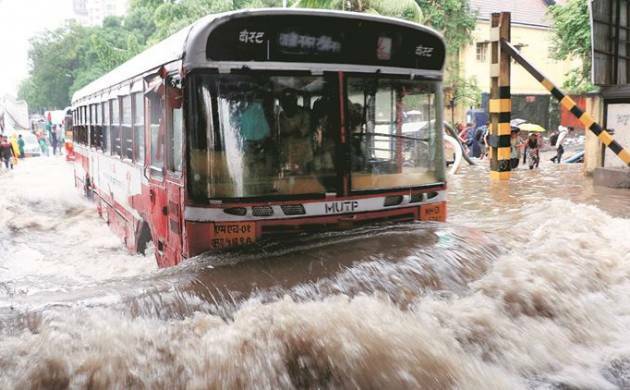 The country has recorded a five per cent deficiency in rainfall this monsoon, the IMD on Thursday said as it forecast “very heavy rain” in Mumbai and parts of central Maharashtra over the next two days prompting the BMC to ask devotees to remain alert during Ganesh idol immersion. An IMD bulletin today said cumulative rainfall for the country as a whole during this year’s monsoon upto September 14 has been five per cent below Long Period Average (LPA). It said the actual rainfall between June 1 and September 14 has been 766.1 mm compared against LPA of 808.1 mm. While east and northeast India recorded a deficiency of 13 per cent, South Peninsula and Northwest India recorded a deficiency of 11 and 2 per cent respectively. Central India, however, received 1 per cent of excess rainfall compared to the LPA for the region. In the national capital, it was a sunny day as high relative humidity levels, between 46-92, troubled Delhiites. The maximum temperature was recorded at 35.5 degrees Celsius, two notches above normal, while the minimum settled at 25.7 degrees Celsius, a notch above normal. The weatherman has predicted “very heavy rainfall” over the next two days in parts of Mumbai and certain areas in Central Maharashtra due to a low pressure area which is moving towards the Western side. “This will cause very heavy rainfall in Mumbai, along with parts of Central Maharashtra, the Konkan region, Marathwada and Goa as well,” IMD Mumbai Director V K Rajeev told PTI. In the wake of forecast, the BMC has issued a high-tide warning for city and asked people to stay cautious during Ganesh immersion. A high tide of 1.21 meters is expected at 11.22 pm, a BMC official said. Ganesh idol immersion processions in Mumbai typically continue overnight to next day morning. Two persons were killed and their wives injured after being struck by lightning at Palli Padmanavpur in Odisha’s Ganjam district on Thursday. The victims had taken shelter under a tree during a sudden downpour when the lightning struck, said inspector in-charge of Berhampur sadar police station, S S Mohapatra. In Bihar, Water Resources Minister Rajiv Ranjan Singh allayed fears trigerred by seepage of water in the left embankment of Punpun river and said it has been blocked and most major rivers are flowing below their danger marks. He said water levels of Kamlabalan and Punpun rivers are above their danger marks. “But there is nothing to worry. All the embankments including left embankment on Punpun river are safe,” he said. The weatherman has forecast light to moderate rains in different parts of West Bengal over the next two days. There was no to little rain in the state in the 24 hours since yesterday morning.